Download "Welcome to NEST. 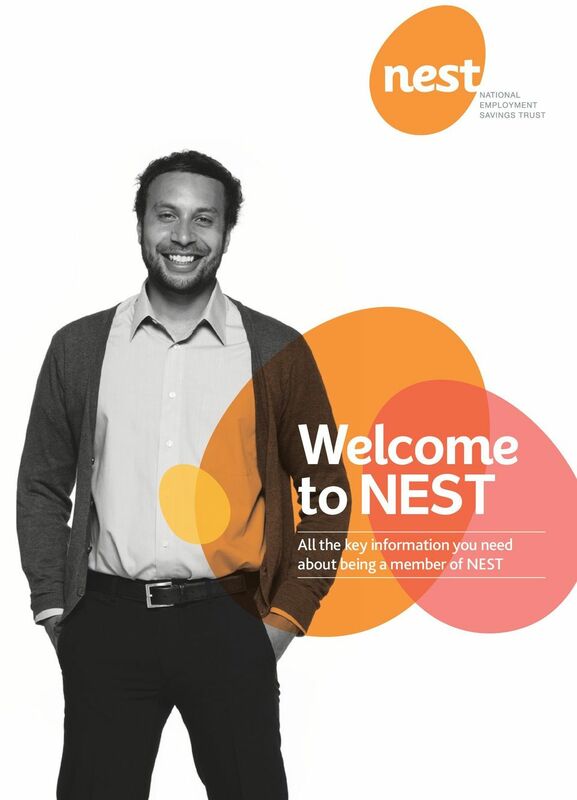 All the key information you need about being a member of NEST"
2 2 Please write your NEST ID here: You ll find this number on the letter that came with this booklet. Welcome to NEST Building a retirement pot is important. We know you take it seriously. We do too. We ve designed NEST to make it easy for you. Now that you re a member you can take control of your retirement pot if you want to. It s up to you how involved you d like to be. NEST is designed to look after your money whatever you choose to do. How do you know how much money is in your NEST retirement pot? You can check what your retirement pot is worth, whenever you want, by logging into your online account. You can also keep track of what s being paid in by you, your employer and the government. 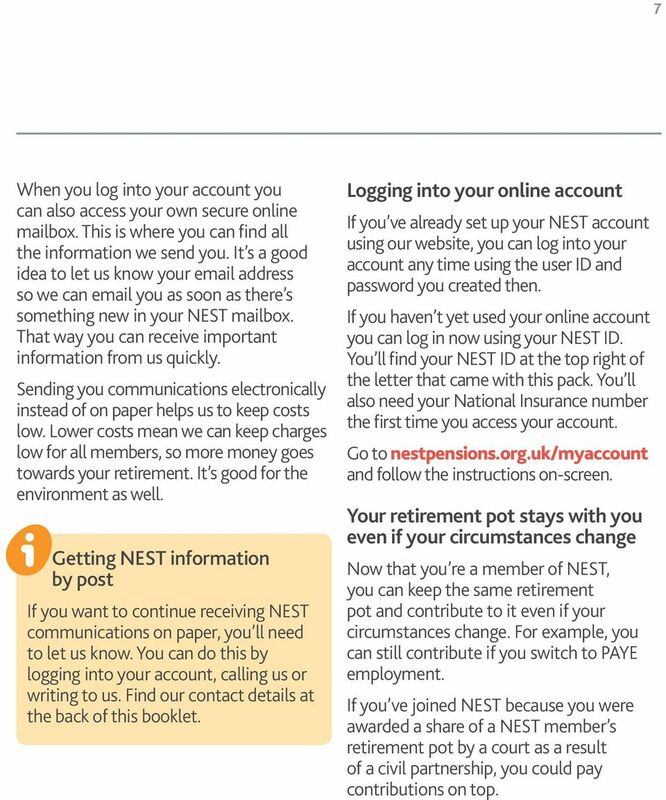 To start using your online account visit nestpensions.org.uk/myaccount Your online account There are lots of reasons to log into your online account. You can read more on page 6. When can you take your money out of NEST? You can choose any date from your 55 th birthday. 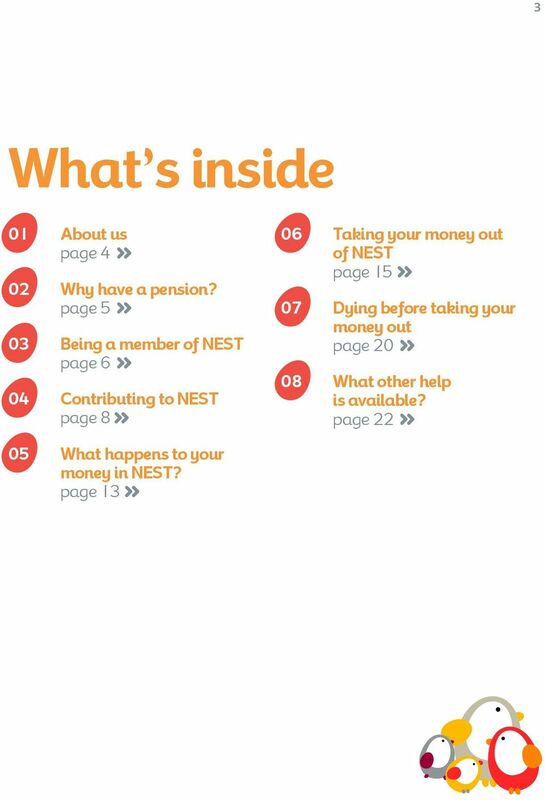 It s really important to let us know when you plan to take your money out of NEST so we can try to manage your money accordingly - see page 13 for more information. You can do this by logging into your account. There s more information about taking your money out on page 15. Who gets your money? Your NEST retirement pot is only there for you and your loved ones. So it s important that you tell us who you d like to receive it if you die before you take your money out. This could be your partner or spouse, a family member or a charity. Find out more about how you can do this on page 20. 5 5 02 Why have a pension? It s a good idea to put some extra money away for your future. A lot of people plan to rely mainly on the State Pension. It s worth remembering that the basic State Pension is a week for 2015/2016. The State Pension can give you a foundation for your income in retirement, but may not give you enough money for the retirement you want. Why a workplace pension is different Putting money aside for retirement needs a special approach. Between now and the time you retire the cost of things such as food, petrol and taking a holiday is likely to go up. You need to make sure your money grows more than the rising cost of living. A pension scheme is one of the best ways of doing this. A pension can also offer some long-term security for your family, partner or loved ones. If you die before taking your money out of NEST and you ve told us who you d like to get your money, we ll do our best to make sure they get it. Putting money away for the future There are many different ways to put money away and lots of people choose to do it through a savings account or by putting cash into an ISA. However, at the moment bank accounts don t offer high rates of interest. When you come to retire you may find that the money you ve saved is worth less than you expected because of the increased cost of living. NEST aims to grow your money more than if you put it in a bank account and built up interest. 7 7 When you log into your account you can also access your own secure online mailbox. This is where you can find all the information we send you. It s a good idea to let us know your address so we can you as soon as there s something new in your NEST mailbox. That way you can receive important information from us quickly. Sending you communications electronically instead of on paper helps us to keep costs low. Lower costs mean we can keep charges low for all members, so more money goes towards your retirement. It s good for the environment as well. Getting NEST information by post If you want to continue receiving NEST communications on paper, you ll need to let us know. You can do this by logging into your account, calling us or writing to us. Find our contact details at the back of this booklet. Logging into your online account If you ve already set up your NEST account using our website, you can log into your account any time using the user ID and password you created then. If you haven t yet used your online account you can log in now using your NEST ID. You ll find your NEST ID at the top right of the letter that came with this pack. You ll also need your National Insurance number the first time you access your account. 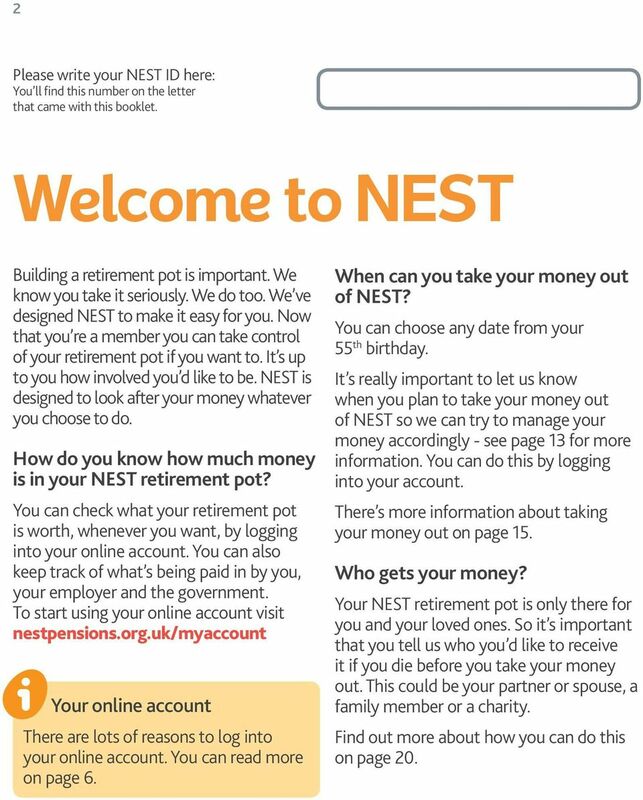 Go to nestpensions.org.uk/myaccount and follow the instructions on-screen. 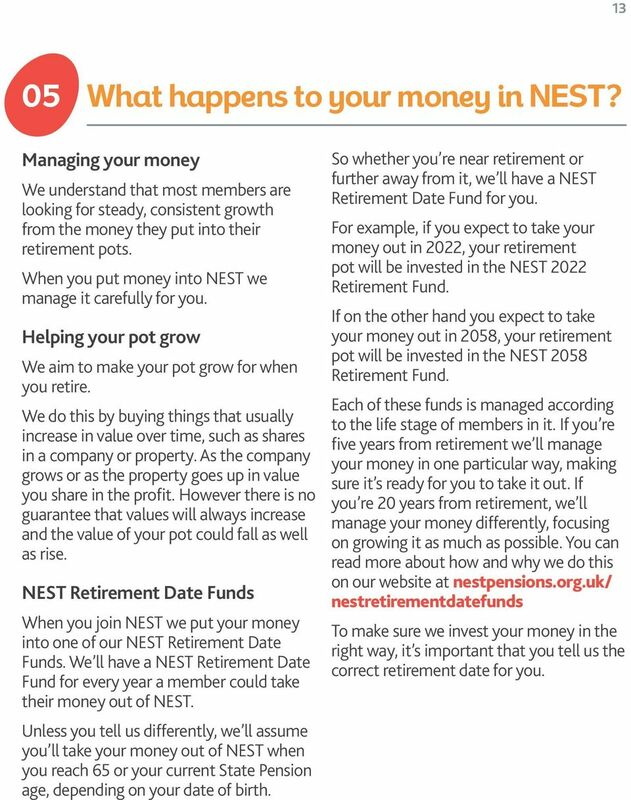 Your retirement pot stays with you even if your circumstances change Now that you re a member of NEST, you can keep the same retirement pot and contribute to it even if your circumstances change. For example, you can still contribute if you switch to PAYE employment. 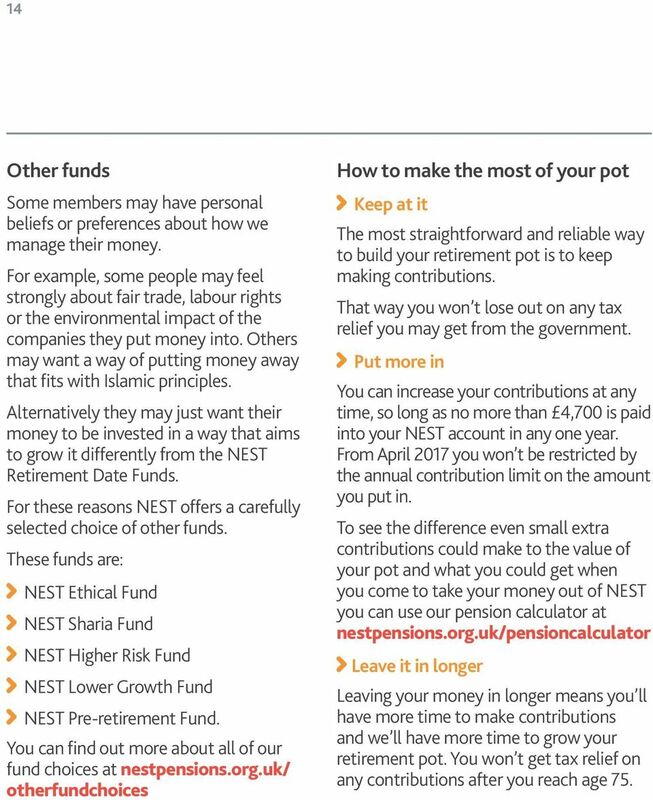 If you ve joined NEST because you were awarded a share of a NEST member s retirement pot by a court as a result of a civil partnership, you could pay contributions on top. 8 8 04 Contributing to NEST The best way to build up a retirement pot is to start as soon as you have the chance and then keep contributing. If you didn t set up contributions when you set up your account, you can do this now by logging in and clicking on the Contributions icon. It s never too late to start. No matter when you start or how much is being paid into your retirement pot, at NEST we ll look after it carefully. Contributing to your retirement pot It s easy to make contributions to your retirement pot online. You can contribute as often as you like. You just need to make sure you add at least 10 each time. You can contribute more if you want to, as long as the total amount added to your retirement pot in any year is not more than 4,700. If you need a reminder of how much you re contributing just log into your NEST account. Taking a break You can stop making contributions at any time if you want to. The easiest way to do this is online. If you stop contributing, the money you ve already put in will stay in your NEST retirement pot until you reach the age when you can take it out. You won t receive a refund of contributions. You can start contributing again if you wish. What does the value of your pot depend on? Contributions - see pages 9 and 10. Charges - see page 11. Growth - see section 5 on page 13. 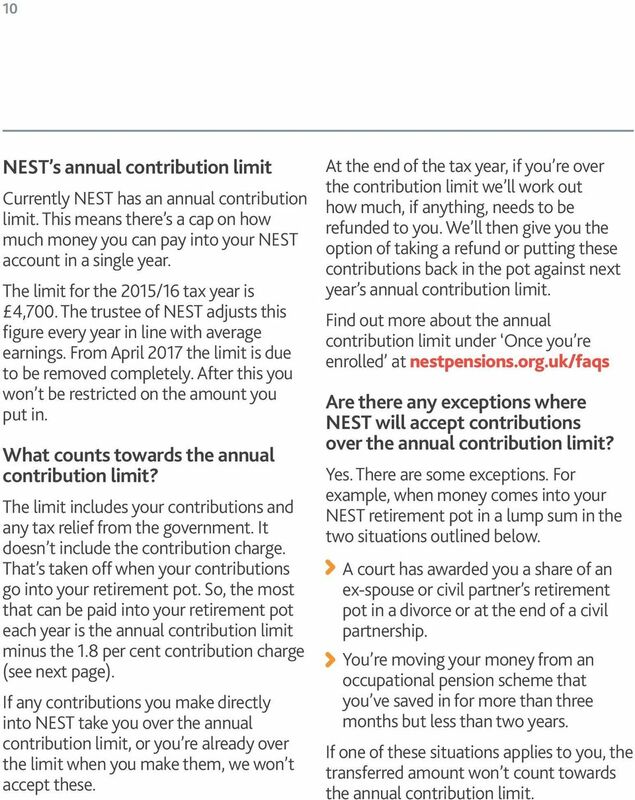 10 10 NEST s annual contribution limit Currently NEST has an annual contribution limit. This means there s a cap on how much money you can pay into your NEST account in a single year. The limit for the 2015/16 tax year is 4,700. The trustee of NEST adjusts this figure every year in line with average earnings. From April 2017 the limit is due to be removed completely. After this you won t be restricted on the amount you put in. What counts towards the annual contribution limit? The limit includes your contributions and any tax relief from the government. It doesn t include the contribution charge. That s taken off when your contributions go into your retirement pot. So, the most that can be paid into your retirement pot each year is the annual contribution limit minus the 1.8 per cent contribution charge (see next page). If any contributions you make directly into NEST take you over the annual contribution limit, or you re already over the limit when you make them, we won t accept these. At the end of the tax year, if you re over the contribution limit we ll work out how much, if anything, needs to be refunded to you. We ll then give you the option of taking a refund or putting these contributions back in the pot against next year s annual contribution limit. 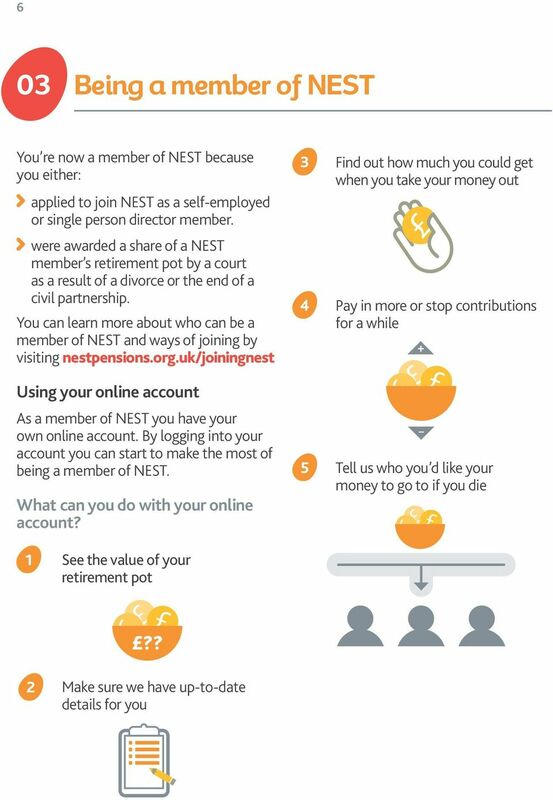 Find out more about the annual contribution limit under Once you re enrolled at nestpensions.org.uk/faqs Are there any exceptions where NEST will accept contributions over the annual contribution limit? Yes. There are some exceptions. For example, when money comes into your NEST retirement pot in a lump sum in the two situations outlined below. A court has awarded you a share of an ex-spouse or civil partner s retirement pot in a divorce or at the end of a civil partnership. You re moving your money from an occupational pension scheme that you ve saved in for more than three months but less than two years. If one of these situations applies to you, the transferred amount won t count towards the annual contribution limit. 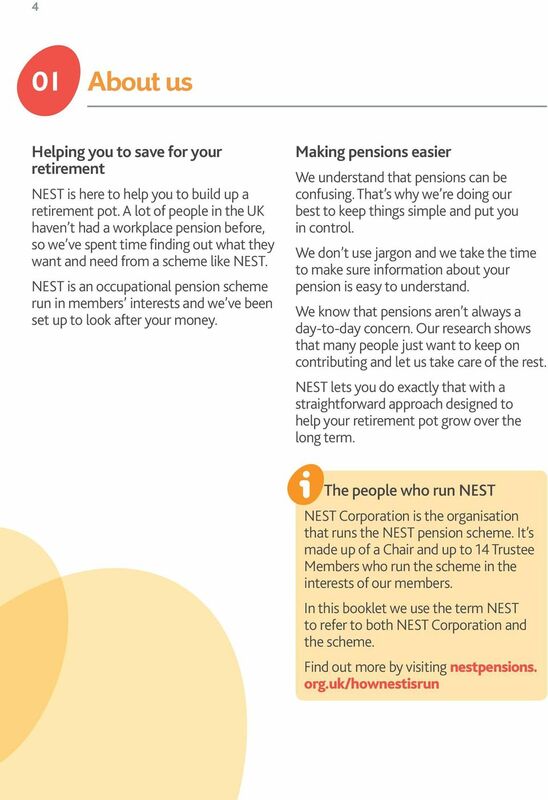 11 04 Contributing to NEST 11 NEST s charges NEST is an occupational pension scheme run in members interests. We don t make a profit from looking after your money. However, we need to cover the costs of setting up the scheme and managing your retirement pot. How our charges work We take a small percentage of the money going into your pot known as a contribution charge. This amount is 1.8 per cent. Suppose 25 is being added to your pot each month. This means of this 25, we take a contribution charge of 45p p 20p 5p We also take a very small percentage off the value of your retirement pot over the year. This is known as an annual management charge. This amount is 0.3 per cent. Suppose your total retirement pot is worth 5,000. This means we charge 15 over the year. 5, In this example, where 25 is paid in every month and the total amount of money in your pot at the beginning of the year is 5,000, the total you d pay in charges in this year is about 20. Over 12 months if 300 is added to your pot, then the contribution charge over the year works out as 5.40. 13 13 05 What happens to your money in NEST? Managing your money We understand that most members are looking for steady, consistent growth from the money they put into their retirement pots. When you put money into NEST we manage it carefully for you. Helping your pot grow We aim to make your pot grow for when you retire. We do this by buying things that usually increase in value over time, such as shares in a company or property. As the company grows or as the property goes up in value you share in the profit. However there is no guarantee that values will always increase and the value of your pot could fall as well as rise. NEST Retirement Date Funds When you join NEST we put your money into one of our NEST Retirement Date Funds. We ll have a NEST Retirement Date Fund for every year a member could take their money out of NEST. 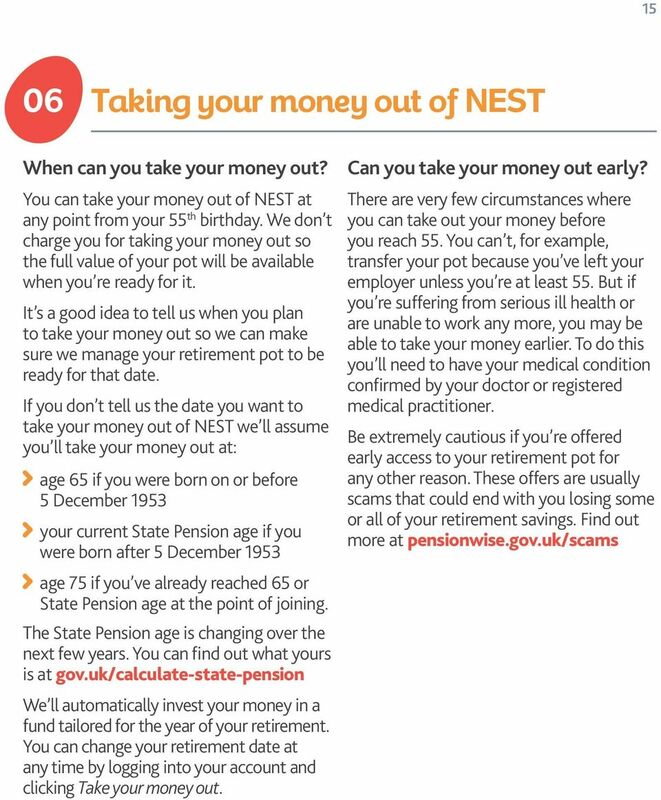 Unless you tell us differently, we ll assume you ll take your money out of NEST when you reach 65 or your current State Pension age, depending on your date of birth. So whether you re near retirement or further away from it, we ll have a NEST Retirement Date Fund for you. For example, if you expect to take your money out in 2022, your retirement pot will be invested in the NEST 2022 Retirement Fund. If on the other hand you expect to take your money out in 2058, your retirement pot will be invested in the NEST 2058 Retirement Fund. Each of these funds is managed according to the life stage of members in it. If you re five years from retirement we ll manage your money in one particular way, making sure it s ready for you to take it out. If you re 20 years from retirement, we ll manage your money differently, focusing on growing it as much as possible. 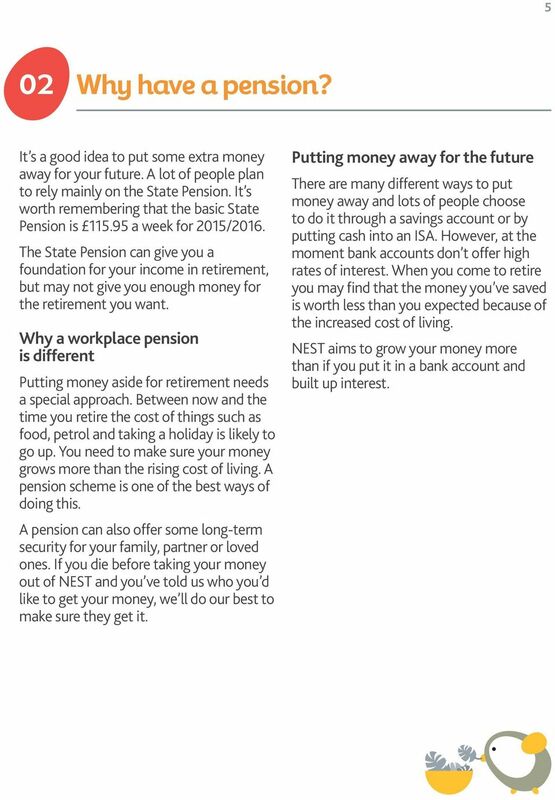 You can read more about how and why we do this on our website at nestpensions.org.uk/ nestretirementdatefunds To make sure we invest your money in the right way, it s important that you tell us the correct retirement date for you. 14 14 Other funds Some members may have personal beliefs or preferences about how we manage their money. For example, some people may feel strongly about fair trade, labour rights or the environmental impact of the companies they put money into. Others may want a way of putting money away that fits with Islamic principles. Alternatively they may just want their money to be invested in a way that aims to grow it differently from the NEST Retirement Date Funds. For these reasons NEST offers a carefully selected choice of other funds. These funds are: NEST Ethical Fund NEST Sharia Fund NEST Higher Risk Fund NEST Lower Growth Fund NEST Pre-retirement Fund. 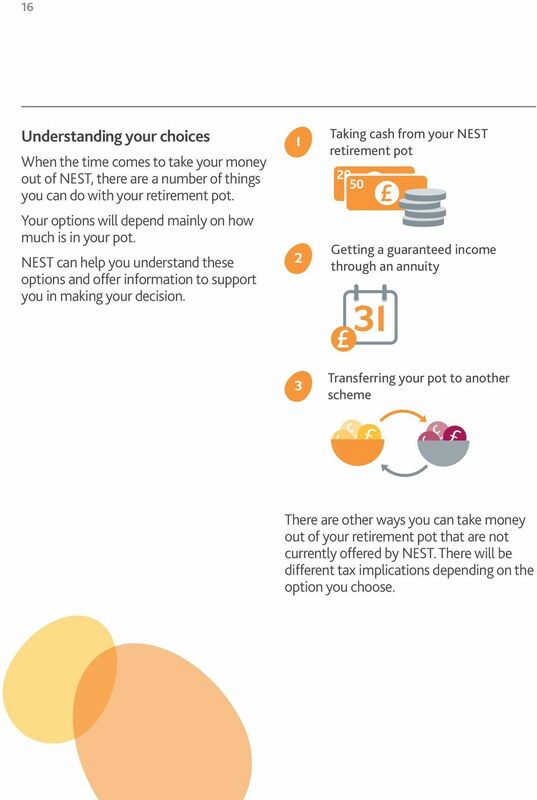 You can find out more about all of our fund choices at nestpensions.org.uk/ otherfundchoices How to make the most of your pot Keep at it The most straightforward and reliable way to build your retirement pot is to keep making contributions. That way you won t lose out on any tax relief you may get from the government. Put more in You can increase your contributions at any time, so long as no more than 4,700 is paid into your NEST account in any one year. From April 2017 you won t be restricted by the annual contribution limit on the amount you put in. To see the difference even small extra contributions could make to the value of your pot and what you could get when you come to take your money out of NEST you can use our pension calculator at nestpensions.org.uk/pensioncalculator Leave it in longer Leaving your money in longer means you ll have more time to make contributions and we ll have more time to grow your retirement pot. You won t get tax relief on any contributions after you reach age 75. 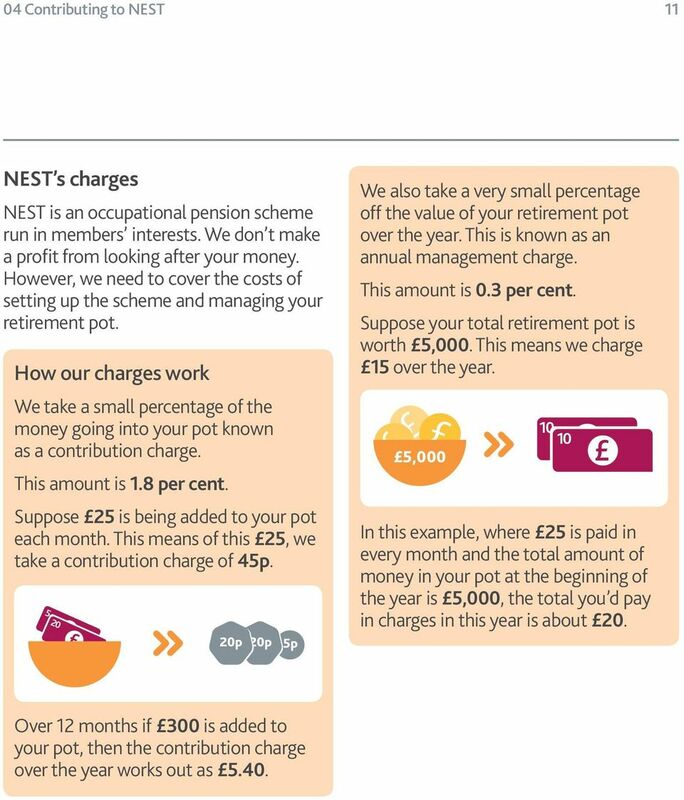 16 16 Understanding your choices When the time comes to take your money out of NEST, there are a number of things you can do with your retirement pot. Your options will depend mainly on how much is in your pot. NEST can help you understand these options and offer information to support you in making your decision. 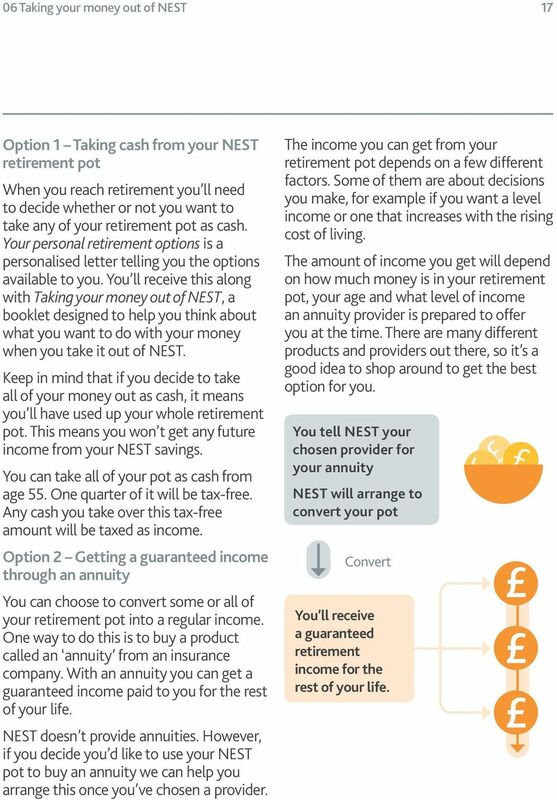 1 2 Taking cash from your NEST retirement pot Getting a guaranteed income through an annuity 3 Transferring your pot to another scheme There are other ways you can take money out of your retirement pot that are not currently offered by NEST. There will be different tax implications depending on the option you choose. 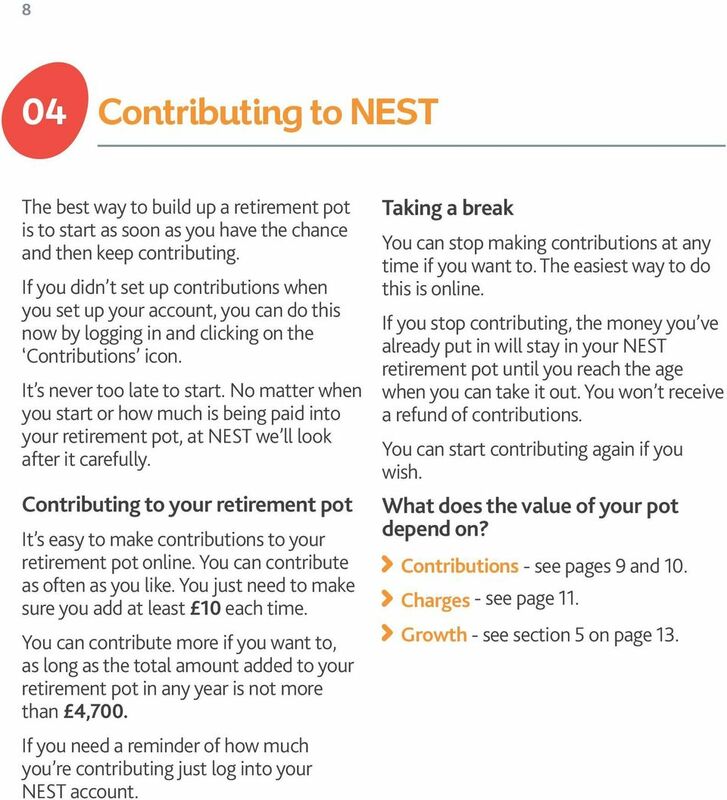 17 06 Taking your money out of NEST 17 Option 1 Taking cash from your NEST retirement pot When you reach retirement you ll need to decide whether or not you want to take any of your retirement pot as cash. Your personal retirement options is a personalised letter telling you the options available to you. You ll receive this along with Taking your money out of NEST, a booklet designed to help you think about what you want to do with your money when you take it out of NEST. Keep in mind that if you decide to take all of your money out as cash, it means you ll have used up your whole retirement pot. This means you won t get any future income from your NEST savings. You can take all of your pot as cash from age 55. One quarter of it will be tax-free. Any cash you take over this tax-free amount will be taxed as income. Option 2 Getting a guaranteed income through an annuity You can choose to convert some or all of your retirement pot into a regular income. One way to do this is to buy a product called an annuity from an insurance company. With an annuity you can get a guaranteed income paid to you for the rest of your life. NEST doesn t provide annuities. 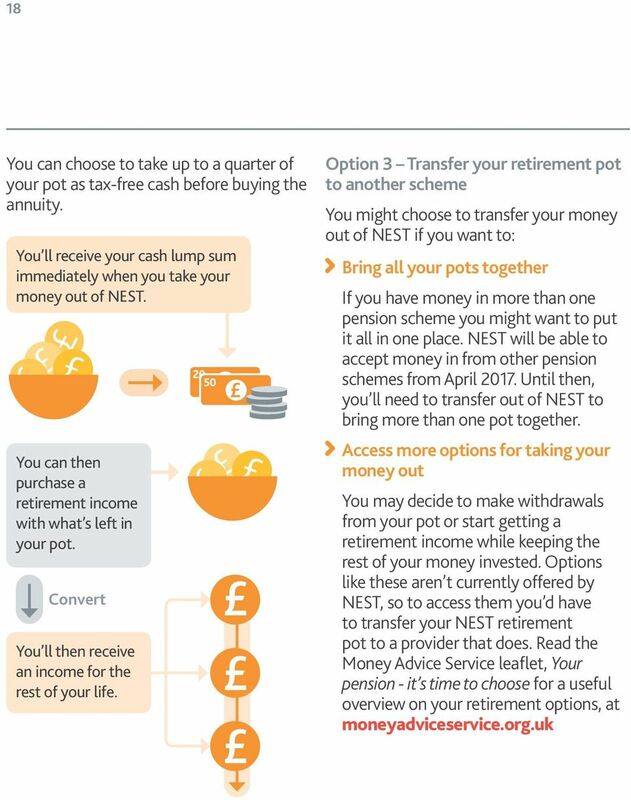 However, if you decide you d like to use your NEST pot to buy an annuity we can help you arrange this once you ve chosen a provider. The income you can get from your retirement pot depends on a few different factors. Some of them are about decisions you make, for example if you want a level income or one that increases with the rising cost of living. The amount of income you get will depend on how much money is in your retirement pot, your age and what level of income an annuity provider is prepared to offer you at the time. There are many different products and providers out there, so it s a good idea to shop around to get the best option for you. You tell NEST your chosen provider for your annuity NEST will arrange to convert your pot Convert You ll receive a guaranteed retirement income for the rest of your life. 20 20 07 Dying before taking your money out Making sure the right person gets your money You can tell us who you d like to get your retirement pot should you die before taking your money out of NEST. This is known as your nominated beneficiary. It could be your partner or a member of your family, your favourite charity, a trust or a combination of people and organisations. It s important to keep your nominations up to date. If you change your mind about who should get your pot you need to tell us. Otherwise, if you die we have to follow your most recent instructions. The quickest way is to log into your account and go to Edit profile. 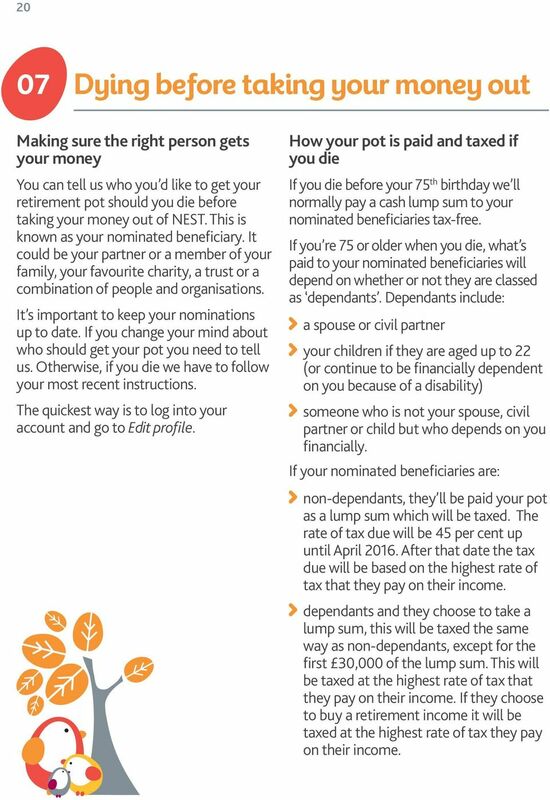 How your pot is paid and taxed if you die If you die before your 75 th birthday we ll normally pay a cash lump sum to your nominated beneficiaries tax-free. If you re 75 or older when you die, what s paid to your nominated beneficiaries will depend on whether or not they are classed as dependants. Dependants include: a spouse or civil partner your children if they are aged up to 22 (or continue to be financially dependent on you because of a disability) someone who is not your spouse, civil partner or child but who depends on you financially. If your nominated beneficiaries are: non-dependants, they ll be paid your pot as a lump sum which will be taxed. The rate of tax due will be 45 per cent up until April After that date the tax due will be based on the highest rate of tax that they pay on their income. dependants and they choose to take a lump sum, this will be taxed the same way as non-dependants, except for the first 30,000 of the lump sum. This will be taxed at the highest rate of tax that they pay on their income. If they choose to buy a retirement income it will be taxed at the highest rate of tax they pay on their income. 23 23 Contact us online If you re a member of NEST, a participating employer or a delegate acting on behalf of a member or employer using NEST, you can log into your account at nestpensions.org.uk and select Raise a complaint in the Admin section. Alternatively you can send us a secure message through your mailbox. Contact us by phone Call us on Write to us NEST Nene Hall Lynch Wood Business Park Peterborough PE2 6FY Information we ll need: the facts relating to the complaint or dispute whether the matter is known to have been brought to the attention of any other regulatory authority (such as the Pensions Ombudsman) whether any legal proceedings are known to have commenced in relation to the same subject matter any relevant documents and correspondence. In certain circumstances, if you re dissatisfied with our response you can ask us to handle your case as a dispute. For details of how to raise a dispute and who can do it, please see nestpensions.org.uk/complaints If you can raise a dispute you can ask us to investigate straight away, without having to make a complaint first. You can do this by stating that you d like your concerns to be handled under the dispute procedure when you contact us. 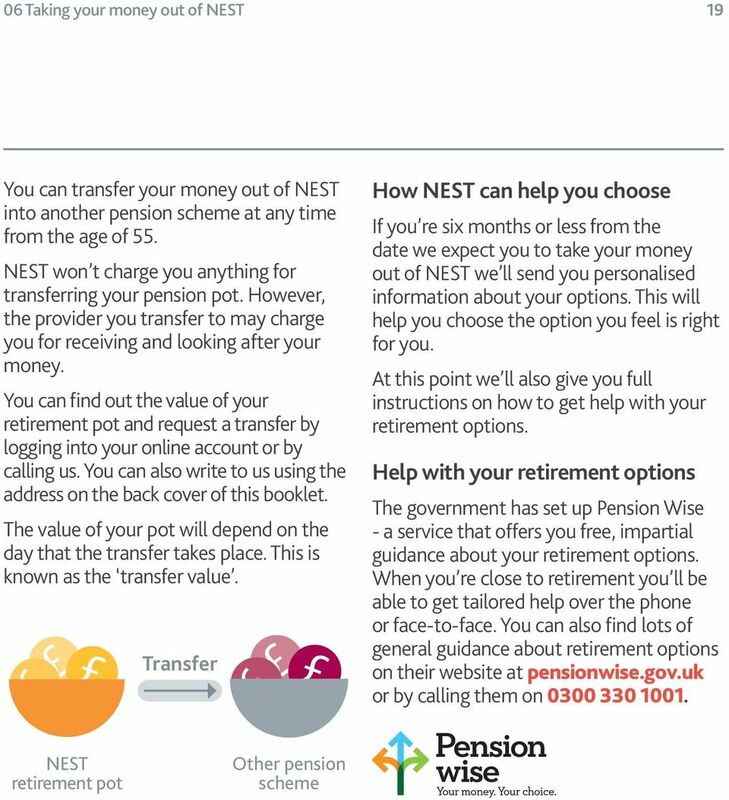 26 26 NEST s registered pension scheme details NEST is a Registered Pension Scheme under Chapter 2 of Part 4 of the Finance Act NEST s Pension Scheme Tax Reference is RD. 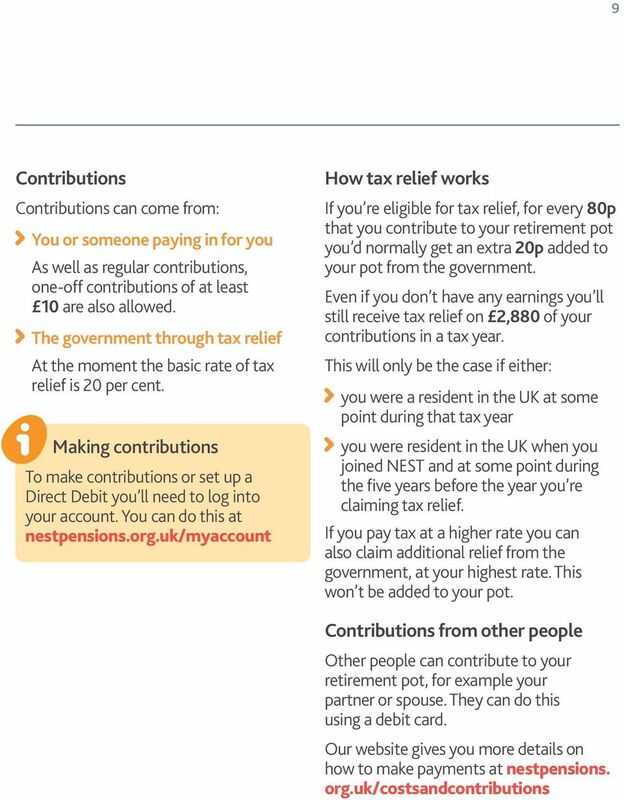 NEST s pension input period There s a limit to how much tax relief you can get on your pension contributions every year, called the annual allowance. You can currently only get tax relief on contributions totalling up to 40,000. The period of time over which this is calculated is called a pension input period. For NEST this is between 1 April and 31 March, the period covered in your annual statement. Other pension schemes may use different dates. For more information see hmrc.gov.uk/pensionschemes/ understanding-aa.htm NEST s order and rules Some of the areas this booklet covers are set out in the legal framework that governs NEST, known as the order and rules. We ve taken care to make sure that where this booklet summarises the order and rules it s as accurate as possible. It doesn t cover everything and the order and rules will always take priority. This version was published in May 2015, replacing the March 2015 version. It covers your membership in NEST and applies to you on joining NEST. If this guide changes and this affects you, we ll let you know. 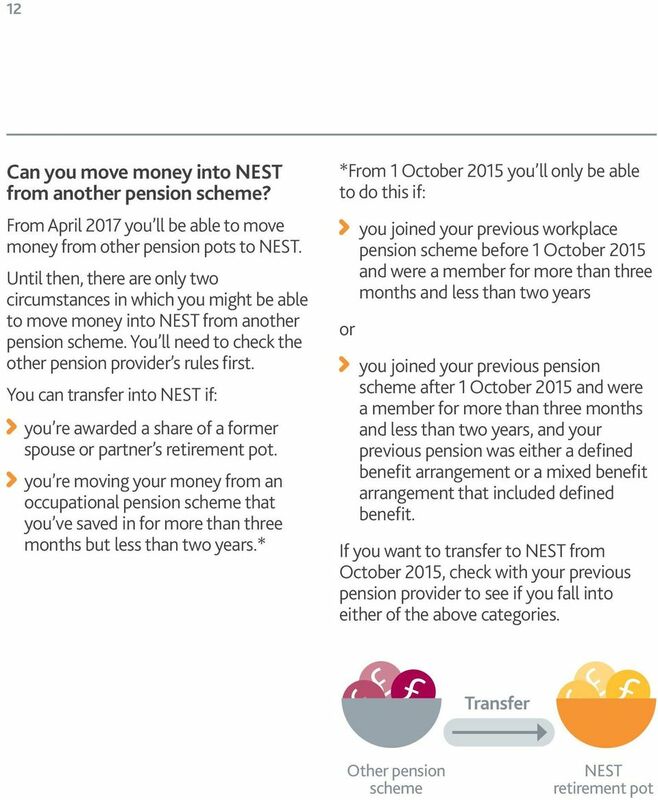 You can read the full order and rules at nestpensions.org.uk Statement on establishing statute NEST was established by the National Employment Savings Trust Order 2010, an order made under Section 67 of the Pensions Act 2008. SIPP Key Facts. This is an important document which you should keep. Spotlight. Defined benefit (DB) pensions and the new pension flexibilities. Have I got a defined benefit pension? PENSIONS REFORM 6 APRIL 2015 YOUR QUESTIONS ANSWERED.